my second time celebrating Mother's Day | escaped. So nearing the weekend, everyone started asking me "what's my Mother's day plans". I started getting Mother's day wishes from relatives and friends, who were so sweet. "Sorry I have to spend the night here in Penang..Kerja tak habis lagi. I will be back tomorrow"
CAN YOU IMAGINE THE FEELS?! You see, we're taking longer time settling down in the new house because..it's huge, compared to our old apartment. In our old small comfy apartment, everything was within reach - this is crucial especially when you have a 14-months old baby who wants to be hanging off your hips every second of the day. But at the new house, we find every chore challenging. At least for me. It feels like a massive house (in comparison to our old apartment, this one feels like a mansion) because I have to carry Rayyan whenever I need to go downstairs if I forget to take something, or vice versa. Imagine carrying a watermelon, no, something that's heavier than watermelon up and down the stairs for 15 times a day. And it doesn't help that this one has a porch outside which I have to take care of. And an equally massive kitchen. 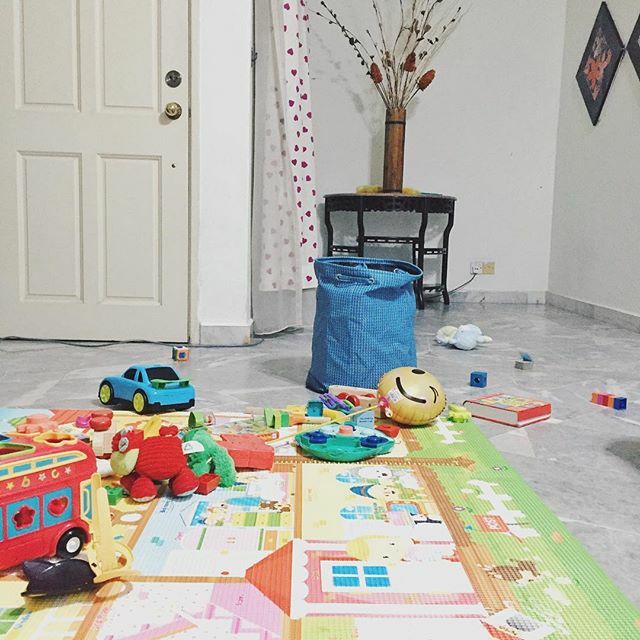 So back to the story, taking care of Rayyan by myself in this house feels..double challenging. Initially having been used to a small space; this new house feels so taskful for me. But I decided to power through anyway. Told husband not to worry while comforting myself that it can't be that hard. So that day, I got back from work on time; picked Rayyan up from his nanny, got home, got him fed, changed his clothes to pajamas, played with him as usual in front of the TV, put him to sleep. And it was 10 pm when I called it a night. Yay, husband is coming back today! Woke up to find Rayyan already awake, playing by himself right next to me. Got him showered - which was the most challenging part because he kept crawling on the bathroom tiles and I fear for his life in case he fell over and hit his head - so I took shower with him instead. After almost an hour in the shower, managed to get him out of bath while struggling to dry myself with a towel, put him on the bed, put his diaper and clothes on, put clothes on myself, and carried him downstairs for breakfast. At the kitchen, while I was doing last night's dishes (didn't have time to do it last night since Rayyan was already sleepy and wanted to sleep) I was wrestling with Rayyan who wanted to play with the kitchen drawers and cabinets (we hadn't childproof-ed everything yet). So at some point I lost my cool and Rayyan cried. Continued doing dishes with a single hand, while my other hand was holding him. Somehow got Rayyan's porridge heated and served. Fed him, fed myself some leftovers from last night since I was too tired to cook. Carried him to the living room where he spent time playing with his toys while I was lying on the couch, unable to move my limbs. Then suddenly it was noon and I received a call from husband saying he's already on his way to the airport. Wiped my happy tears and put Rayyan to nap. Took a nap myself. Woke up to find Rayyan's already awake. Then..suddenly there was a doorbell. Apparently he took earlier flight, and was already boarding when he called me earlier. ...I was speechless. Feels so good to have my man back at home you have no idea. Made a mental note to draft a hatemail to my husband's employer later. For breakfast, the husband brought us to this place "for celebration". He won't usually go there on normal days because they're overpriced, so I knew he wanted to make me feel better when he made efforts like this. Then in the afternoon, I requested for a facial session for me while he took Rayyan to the playgym.Went to the same place I went on my birthday, only with different kind of feelings - this time, I truly feel like I deserved it. Sometime during the hectic day, I told him he hasn't wished Happy Mother's Day to me. Not that it's such a big deal; but I was just curious. "I haven't gotten a wish from you"
"...well because everyday is Mother's Day to me"
But proceeded to wish me anyway LOL. Now I know what to tell him on Father's Day! So that's how I spent my Mother's Day weekend. Thank you for this honest sharing. Now I feel relieved knowing other mums face the same thing lololol. So glad someone shares my sentiment haha. Hope I dont scare off any potential parents-to-be lol.